This will be one of many adventures we had on Sunday at the Cherry Blossom Festival in Japan Town, SF. I guess you can say that I am a huge fan of Japanese culture, so I dragged Ms. Lin to the festival with me. A few years ago I went to the Pasadena Cherry Blossom Festival and that was a HUGE disappointment. The only thing they had that was a cherry blossom was a puny cherry tree stick. It definitely wasn't worth the hour and a half trip! Luckily this festival was just 10mins away in Japan town and free, so why not! Sounds like a lot of fun. Ms. Lin and I definitely did not enjoy getting up early to go to the festival. Parking was murder too, but that's just a price you must pay. ^_^ To start off the festival posts. I am going to talk about the yummy foods we tried. The first thing I got was Imagawa Yaki, like a pancake with sweet red bean filling. Typically I despise anything with beans in it, but I thought that I should be open minded and try some fresh pastries. 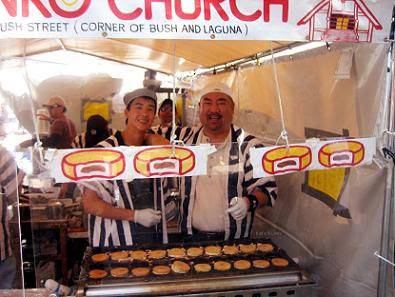 At first we thought the line we were standing in was the Takoyaki line, but we made a mistake. So I took it as a sign that I should just wait it out and give this a try! The people there were super friendly and funny. I talked to some of the guys and told them that I came from the OC. They joked around that I came especially to see the two guys making the Imagawa Yaki. So they struck a pose! ^_- Of course I had to pay tribute to them on my site! All in all the snacks were hot and fresh. Ms. Lin commented that the dough had a salty tastes. I think that's done on purpose to bring out the sweetness of the red bean paste and to add flavor. They were a nice little snack. I still don't really like red beans but the atmosphere of the fair and the people there just made everything enjoyable!